It is not our intention to fill these pages with long and boring recollections of plot and storylines. Our reviews will contain only the barest of essentials on that front and are meant more as a springboard for further investigation. While many of these films are over forty to fifty years-old they have lost none of their incredible vitality or ability to influence and inspire, and – we think, and hope you agree – are just as relevant and electrifying as they were when originally released. For further information about DVD releases - print and sound quality; extras, and availability - click the disc comparison links. Links to purchase available editions are also provided. For more read our FAQ. 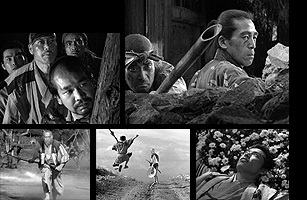 What can be said about Seven Samurai that has not been said before? Revered as a classic of world cinema; held in high regard by countless big name film-makers, used by midwives as an instruction video for expectant mothers... Actually that last line was a lie, but you get our meaning: Seven Samurai is a bloody good film. cements at least twenty people into the All-Time Greats category. Mifune and Shimura are both at a pinnacle in their careers, though Minoru Chiaki (Heihachi), Isao Kimura (Katsushiro). Yoshio Tsuchiya (Rickichi), Daisuke Kato (Shichiroji) and Bokuzen Hidari (Yohei) all play memorable roles. The unique face of Bokuzen Hidari - a man who's fizzog has become a comic book icon in Japan - is particularly memorable. it has an honesty and a heart that shines through brightly. modern and we might have some problems relating to a bunch of 17th Century peasants. but the overall themes are pretty much universal in their appeal. Seven Samurai appeals to all cultures for the same reason that Star Wars does - it takes universal themes and weaves the central story around them. represented on DVD. Both BFI and Criterion have full-length versions on the market though the ultimate is currently Criterion's three disc special edition, which is awesome. only very good-looking, but also an early archetypal Japanese 'manga babe'. Such is her striking look. 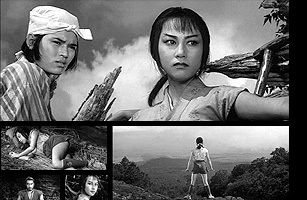 From the opening scene onwards it becomes clear that The Hidden Fortress is quite a light-hearted, humourous film - even if there is a lot of suffering on display. This can be primarily attributed to the two lead characters, Tahei (Chiaki) and Matakish (Fujiwarai), who whinge and moan constantly. Toshiro Mifune also puts in a subtle comedic performance as the General, further underpinning the light-hearted tone of the fillm. the template for modern widescreen cinema. the bellucose music over the opening titles; the opening shot of a group of samurai on horseback approaching Tahei and Matakishi is strikingly similar in feel to the Star Destroyer coming into frame at the beginning of Star Wars. There are many other examples, but we're not trying to illustrate how George Lucas ripped Kurosawa off, just how Kuroawa influenced modern cinema in a visual and musical manner with this film. and it’s clear to see how it raised the benchmark for film-makers back in 1961 when it was first released. ‘Tohoscope’ widescreen format with extreme framing, accentuating many famous scenes. A highly unusual use of angles; the skilled use of long telephoto lenses, coupled with ambitious moving camera shots, all combine to make something marvellous to watch. qualities. The bone chinking “Mickey Mousing” music accompanying the infamous scene of the dog trotting by with the severed hand in it’s mouth is an apt prelude to the foreboding of Sanjuro’s signature theme. It makes you smile, only: nervously. The drums, strings and woodwind are in perfect unison from the moment the rousing opening sequence begins. Sato’s music makes you feel as though something amazing is happening. And, let's face it: something is. To us it's surprising that Yojimbo isn't shown on TV more often - it's a truly entertaining film that isn't too gruesome by today's standards. That said: it's easily available on DVD with a PG rating. Owning a copy of Yojimbo must be a priority for any Kurosawa fan and thankfully there are some good DVDs around, with plenty of extras. We do have to ask though: will there ever be a high def version? We can but hope. The popularity of Yojimbo led to a sequel being released the following year, and Sanjuro is it. Mifune returned as the titular main character - a Ronin (masterless samurai) at a loose end and with a penchant for getting involved in other people's business. Tatsuya Nakadai also returned as the film's primary bad guy, only this time with less hair and without a pistol. frame their master. Full of hubris and with an initial distrust of Sanjuro, the samurai are gradually shown the error of their ways as the flea-bitten hero both helps (and often humiliates) them by showing the way, and killing lots of baddies in the process. static 'discussion' scenes into wonderfully-shot set pieces. As usual: Kurosawa's script, and editing are marvellous throughout and further accentuate the quick pace with which this film unfolds. Sanjuro, it could be argued, is every bit as good as it's prequel. Masaru Sato's brilliant music makes a welcomed return, as do the cast who are mesmerising to watch. By the time the film reaches it's often talked-about ending, the viewer is nothing if not completely satisfied they've been thoroughly entertained. And the action, when it comes, is breath- taking in it's intensity - as you would expect. 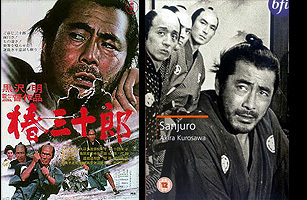 Sanjuro is an essential part of any Kurosawa fan's DVD library. Kurosawa's Oscar-winning 1975 biopic Dersu Uzala is based on the 1923 memoir of the same name by Russian explorer Vladimir Arsenyev. It follows Arsenyev's many expeditions into the wilderness of the Sikhote-Alin region of Russia in the early 20th century, and his meeting and subsequent friendship with a native of the forest called Dersu Uzala. camp fire one night when out of the darkness walks a small, elderly man with a large rucksack on his back. He sits, lights his pipe on an ember and introduces himself as Dersu Uzala, hunter of the forest. Arsenyev asks Dersu if he will be their guide, and from that moment on the men become inseparable. and his men as they begin to recognise the depth of his knowledge of the wilderness. As a viewer, to watch Maxim Munzuk play Dersu Uzala is joy to behold. You get to thinking: "how on earth did they find this guy for this role?" He could not be any better suited. In fact, all the cast are great in their roles. Munzuk, though, is something special. fascinated by the adventures of this small hunter and his band of friends - no matter how mundane their actions seem to be. They go from scene to scene warming our hearts by rescuing trapped animals, helping mountain hermits, and generally being at one with the landscape. real tear-jerker, and you can imagine hushed audiences filing out of the theatres back in 1975 wondering how they were going to sleep that night. Not that there is anything in this film that will give you nightmares (it's perfectly child-friendly we think), but - just like in real life - what happens between people can be so tragic. and the people acting the roles. Not to mention the rich Russian landscapes, which Kurosawa captures on film so wonderfully in widescreen. The story, and the film's main themes of friendship, survival and loss are all capable of touching the heart of any viewer in any country of the world, regardless of language. waste of time/life, oh the humanity!". You may be angry, or even be in tears, or feel emotionally shattered by what you have just seen. Ultimately, though - if you discount the ending - Dersua Uzala is an uplifting story about a life lived by a culture lost to time, and a celebration of the Russian countryside and past way of life. 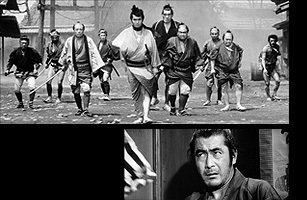 Which has been brilliantly recreated by Kurosawa in this unique and fascinating film.